I recently spend 2 amazing weeks in Thailand and although I’m so thankful for the long break, it wasn’t nearly enough time to explore everything I would’ve liked to! I’ve written up a guide to Phuket, of what I did wrong and right, the things you can’t miss, where to stay, great restaurants and of course, the all important Phuket adventures. You can shop around to find the cheapest deals for flights to Thailand. I flew to Phuket airport with a short stopover in Dubai with Emirates airlines, my favourite and most comfortable airline in my opinion, so I’m happy to pay more to fly with them. Also a great way to add up those air miles! High tourist season is from November - May when there’s less rain, so flights are usually more expensive then. Travelling at the beginning of October meant flights were slightly less although there was a considerable amount of rainy days during my trip, the monsoon season lasts from May up until October. Skyscanner is the best way to find the cheapest flights to Thailand as well as the cheapest time to travel. I think it’s essential to travel around whilst in Thailand, there’s so much to see and so many different places that aren’t necessarily close to each other. Definitely do a lot of research before you travel, staying in locations close to attractions you want to visit is quite important as taxi costs can rack up quickly! All of the hotels I stayed in were really beautiful, and prices ranged from mid-range to luxury budgets. The first hotel I stayed in wasn’t actually in Phuket but around a 2 hour drive away, it’s definitely worth a mention in case you want to escape to a quieter side of Thailand which is perfect for couples, extremely romantic and very chilled out. Casa De La Flora is part of the Design Hotels masterpieces, a space of land which was rebuilt after the tsunami in 2004. Each of the rooms are extremely private and spacious, most with breathtaking views of the sea and sunsets that cannot be missed! 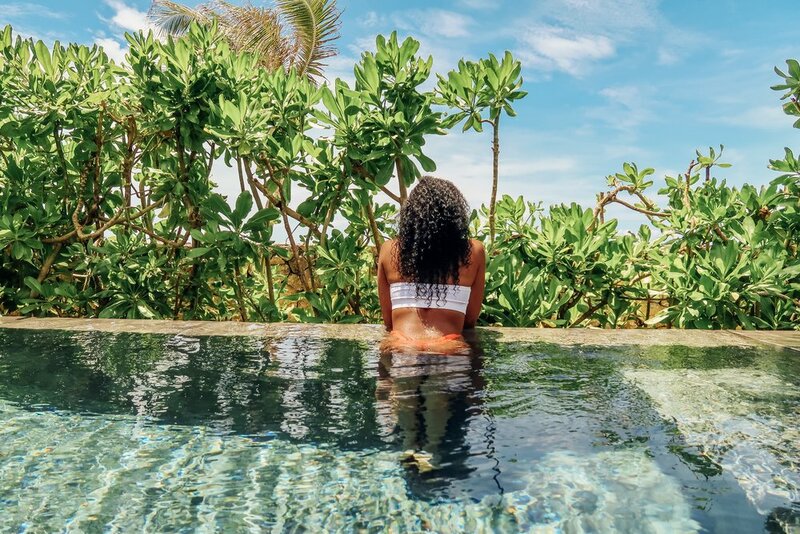 Go for a Beachfront Suite Pool Villa, the villa comes complete with a cosy living area, huge stone bathtub, bed overlooking the sea where you can hear and feel the waves crashing up onto the shore and the best part, a private plunge pool, jacuzzi and cabana style sunbed. The food on the resort is amazing, with a wide selection for breakfast and international as well as local dinner options (you HAVE to try their chicken cashew nut, it’s AMAZING!) The hotel is an hours drive from the airport and extremely close to popular attractions such as Similan Islands and the James Bond Island tours. Double rooms start from around £280 although you can shop the best deals on rooms using Trip Advisor. 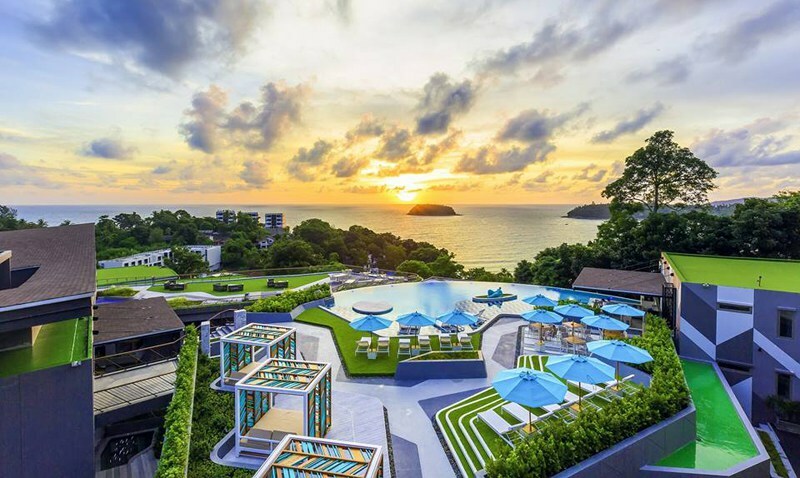 My Beach Resort is a luxury five-star private hideaway overlooking Phuket's stunning Cape Panwa offering some of the best views on the island. Honestly, I found the hotel a little boring and out of the way, especially during the rain, there isn’t much to do. Most of the main attractions in Phuket are quite far away so taxi costs can get pretty high. We stayed in the Premier Seaview Studio room which has panoramic views of the beach directly in front and round bathtub on the balcony, you could even see a glimpse of the Big Buddha from this room, which was really beautiful. We then moved to a Private Pool Beachfront room, the private pool is perfect for a sunset dip with room service by the pool. The food at My Beach was slightly disappointing, breakfast was quite minimal and I spotted flies constantly around the breakfast buffet which can be very off-putting. Rooms start from £115 per night, shop the best deals on Trip Advisor. The Sis Kata is a beautifully designed stylish hotel in a great location, great pool and breakfast is amazing. So we ended up wishing we’d stayed at The Sis Kata the entire rest of our stay in Phuket instead of My Beach. It’s such a modern hotel, only a few minutes walk from Kata Beach. We stayed in the Jacuzzi Pool Room, which I definitely recommend (although the water is a little cold), it’s very private and the room is a cosy size, the only minus for me was the lack of suitcase space. The breakfast buffet serves everything you could dream of craving from freshly made pancakes, omelettes and waffles to spring rolls, noodles and dim sum selections. The location is perfect for getting around Phuket, really close to a beautiful beach, lots of beach clubs, restaurants as well as temples. Rooms start from around £65 per night which is an absolute steal! Check Trip Advisor for the cheapest rates. I found that 2 weeks in Thailand wasn’t anywhere near enough to do all the things I wanted to do. There’s just so many beautiful places to visit, excursions and activities to do, not to mention relaxing massages, luscious beaches to lounge on and amazing restaurants to dine in if you just want a chilled break. My holiday was sort of a mix of both, although I would’ve loved some extra lazy days. Check out Klook & GetYourGuide for things to do in Phuket along with an easy and safe booking system and cheap prices for so many excursions and activities, they offer everything from Phi Phi Islands Tours, Ziplining, James Bond Island Tour and Helicopter Tours. Have a read of my 10 things to do in Thailand for more ideas. Thailand is the number one spot for good food, pretty much everything I ate over there was amazing, from the street food to the fancy restaurant. If you’re looking for romantic restaurants in Phuket, this is definitely one of them. A bit of a drive North of Phuket but definitely worth a visit. Located within the gorgeous hotel The Slate, Black Ginger offers authentic flavours of Phuket in a modern masterpiece of ancient Thai architecture, floating magestically on the softly-lit lagoon across the water. The restaurant is accessed by a wooden raft which you stand on and just has a magical atmosphere, even in the rain when I visited. Each dish is a carefully crafted mix of flavours honed from centuries of the island’s multi-cultural heritage, served in an enigmatic setting of traditional Thai forms and renowned Thai service. I recommend the Bua Tod (shrimps) and Gai Pad Med Mamaung Himmapan (cashew nut chicken). A former governor’s mansion built in 1903, the Chinese-colonial style mansion with amazing grounds near the heart of the old quarter of Phuket Town. Staff are so attentive and friendly and the fine-dining atmosphere is complete with golden cutlery and hand painted plates, Blue Elephant really does make for the perfect fine dining destination in Phuket. The menu is classic Thai with no holds barred, with many compliments from the chef the experience as a whole is definitely worth the price is comes with. I could roam around the old town for hours, there’s just so many cute little shops, cafes and the art along the pastel coloured buildings reminds me a colonial Cuban town. If you love roti like I do there’s so many spots that just sell this on the outside of the shops, Abduls Roti Shop is famous in Phuket Old Town for having the best roti. You can also have a range of different toppings and fillings, from sweet to savoury, all amazing!